This is story of the Nabi clan a Syrian-Kurdish family who fled Aleppo and struggle to make their way from the Greek/macedonia border to Berlin where other members of their family live. Good look at what is required by refugees to sneak across Europe to get safe haven. Where other films give us bits and pieces of the journey SKY AND GROUND shows us the entire trip. 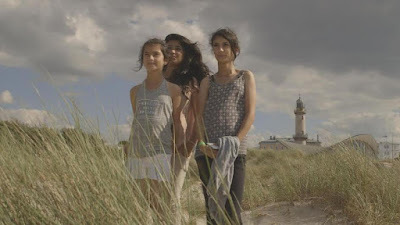 While the film is to be applauded for it's detailing of the journey of refugees, the film suffers due to the high volume of films detailing the refugee crisis. We've kind of been here before and directors Talya Tibbon and Joshua Bennett don't give us enough to make the film stand out. While never bad the film never is completely gripping enough. Recommended for anyone who wants to know what the journey of refugees is like. SKY AND GROUND world premiered nigt at DOC NYC and it rescreens on November 16. FOr more information and tickets go here. Where can you watch this if not in NYC? As far as I know the film has just started on it's festival tour. The film WOrld Premiered at DOC NYC and I was told it was heading on to the festival circuit. I don't know what the plans are after that tough I suspect it's going to get picked up for release which means it will return for regular play dates. I would keep an eye out for it. I would also watch the local festivals like Human Rights Watch which would be a perfect fit for the film. Thanks, this docu was discussed with the filmmakers on Morning Joe today but no mention of where it was playing.